Despite a gruelling day against India on the field, Tim Paine, the Australian skipper, managed to share a lighter moment during his press conference after the end of the second day's play of the ongoing fourth Test. In the middle of the press conference, a call popped up on one of the journalists' phone at Tim's table, which he answered in the funniest way possible. 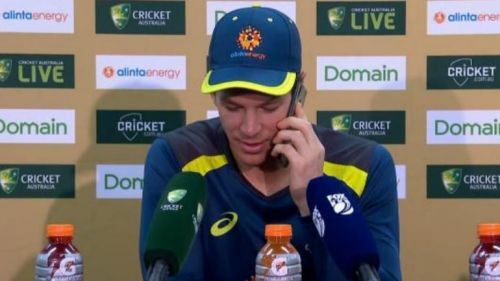 While picking up the phone, he conversed, "Tim Paine speaking. Who is it, sorry? Who are you after? Martin? He’s in the middle of a press conference at the moment. No worries, I’ll tell him to check his emails," the thread ended. The visitors frustrated the Australian team as the Indian batsmen continued batting for one more day in the ongoing Test. However, the physical and mental fatigue didn't seem to take over Tim Paine as he re-established the fact that why he one of the 'coolest' Australian captains ever. Tim Paine was Australia's face at today's press conference at SCG. And the moment he got in, the journalists started throwing in some questions. In the middle of one such question, when Paine was about to answer the question, a phone rang which was of a journalist named Martin present at the scene. The Australian skipper picked up the call and started conversing with the person at the other end. Those present at the press conference burst out laughing. After having won the MCG Test and going 2-1 up in the series, the Indian team advanced to the SCG Test in a bid to complete a historic series win. Virat Kohli won the toss for India and decided to freshen up their willows. Having won the toss and choosing to bat first on Day 1, India posted a total of 303, losing just four wickets, on the back of Pujara's marathon hundred. On the same lines, the Indian team managed to frustrate the Australian bowlers on Day 2 as well, before declaring their first innings at 622 for the loss of seven wickets. Rishabh Pant and Ravindra Jadeja stole the limelight on Day 2 as the former hit the highest score for Indian wicket-keeper outside India. With India declaring at 622 and Australia ending the Day 2 at the score of 24 for no loss, the Indian team will be hoping to wrap us Australia's batting as early as they can while giving them an unassailable lead in the match and the series as well. Meanwhile, the Australian team will be looking to negotiate the Indian bowlers with the hope of coming close to India's first inning's total. No matter what, an exciting Test match awaits us ahead.